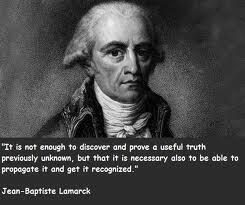 Jean Baptiste Lamarck was born on August 1, 1744, in the village of Bazentin-le-Petit in northern France. He was the youngest of eleven children born to noble parents, but he lived a life that was hardly prosperous. His father, a military officer, expected his son to become a priest. He sent Lamarck, then eleven years old, to the Jesuit school at Amiens, France, where he remained until his father's death in 1760. At age sixteen, Lamarck left school and joined the army in search of adventure. He fought in the Seven Years' War and afterward spent five years at various French ports on the Mediterranean and eastern borders of France. This traveling introduced him to the plant species of many different French regions. In 1768, an illness forced Lamarck to leave the military, and after several years, he found a job in a Paris bank. During the next four years, he studied medicine and became increasingly interested in meteorology, chemistry, and shell collecting. In 1778, Lamarck published Flore française, a meticulously compiled catalog of French flora. To identify each plant, Lamarck used a dichotomous key; that is, a systematic list of key characteristics. By comparing the plant's characteristics to the listed traits at each stage of identification, large groups of dissimilar plants could be quickly eliminated and the plant's identity easily determined. The book and Lamarck's method soon attracted the attention of noted biologist Georges Buffon, who nurtured Lamarck's interest in botany and in 1781 secured him the position of botanist to King Louis XVI. Lamarck continued to work at the Jardin du Roi until the French Revolution resulted in its dissolution. When the institute was reopened as the National Museum of Natural History in 1793, Lamarck was made a professor of zoology and placed in charge of organizing the museum's collection of animals and fossils without backbones. During the early 1700s, Swedish botanist Carl Linnaeus had grouped these creatures into two general categories: insects and worms. Lamarck, however, did away with Linnaeus's categories. He named the entire group invertebrates and then set about classifying them according to their anatomic similarities. He differentiated eight-legged arachnids from six-legged insects, and echinoderms such as starfish and sea urchins from crabs, shrimp, and other crustaceans. He eventually published the results of his efforts in his seven-volume work, Natural History of Invertebrates (1815-22), which is today considered his most important contribution to botany. While creating his classification system, Lamarck, who had previously believed in the fixity of species, gradually developed an evolutionary theory to explain the differences between living animals and fossils. Having already rejected the idea of extinction, Lamarck proposed that species gradually changed over time. He also theorized that living creatures fit into a linear, hierarchical scheme that began with the simplest life form and progressed to the most complex--humans. To account for such a progression, he set forth four laws, which he published in his Zoological Philosophy in 1809. The laws stated that organisms possessed an innate drive toward perfection; that they could adapt to the environment; that spontaneous generation occurs frequently; and that acquired characteristics could be passed from one generation to the next. Lamarck is best known for this last law, the Theory of Inheritance of Acquired Characteristics, although it has since been disproved. The most famous example he gave of this law concerned the giraffe. He hypothesized that the giraffe gradually evolved its long neck from a primitive antelope-like animal that had to keep stretching its neck to reach higher leaves. According to Lamarck, this stretching caused the primitive animal's neck to grow longer, and this acquired characteristic could be passed on to its offspring. During his lifetime, Lamarck's theories were largely ignored by the scientific community. At age 65, he lost his eyesight but continued writing with the help of his daughter, who took his dictation. Lamarck died in great poverty on December 28, 1829, and his family was forced to sell his papers and scientific collections to pay for his funeral. During the mid-1800s, critics of Charles Darwin briefly revived interest in Lamarck's work in hopes of debunking the English naturalist's theory of natural selection, an attempt that proved futile. Although Lamarck's belief in acquired characteristics was incorrect, he remains the first scientist to acknowledge the adaptability of organisms and develop a consistent evolutionary theory.